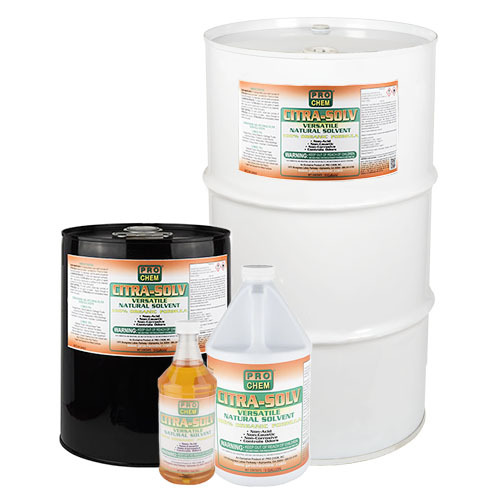 CITRA-SOLV | Pro Chem, Inc.
Made from the highest quality orange solvents, CITRA-SOLV is a truly remarkable 100% organic formulation, which represents an exclusive approach in one-step degreasing and deodorizing. The natural, orange solvent in this product provides a multitude of added applications such as odor control, unclogging drains and the removal of tar and asphalt from most hard surfaces. It is a noncorrosive, multipurpose formula that effectively strips grease and heavy oil deposits from practically any surface. Citra-Solv is intended for use as a compound in drain lines and/or sewage systems in areas of official establishments operating under the Federal meat, poultry, shell egg grading and egg products inspection programs where there is no possibility of food contact in food processing and food handling establishments. To unclog drains, pour eight ounces of CITRA-SOLV directly into drain. Let stand for one hour or more. Flush with hot water. For disposals, use the same procedure. To clean and degrease surfaces, dilute four ounces of CITRA-SOLV into one gallon of warm water. Apply solution generously to surface to be cleaned. Let stand for five minutes. Rinse thoroughly. For odor control, dilute two ounces of CITRA-SOLV into one gallon of cold water. Apply through a sprayer to odor source. CITRA-SOLV will immediately leave a fresh citrus scent. Also available in aerosol. 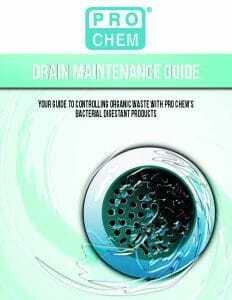 See product #1424 in the Solvents and Degreasers section.